Ramblings of an Impatient Artist: Fabulous Freebie Friday!!! It's Fabulous Freebie Friday! Head over to Sassy Studio Designs on Paper Craft Planet and pick up a FREE Sassy Studios image (click here), it will only be available 24 hours. Our challenge for this fortnight is to use something from your stash! (these challenges run for 2 weeks). You don't have to go out and get something new to work with, although it is fun. I'm sure there's ton of fabulous things you already have that you can use to create something wonderful. Remember just like Cinderella, you have until midnight (okay pretty darn close) to get your freebie - I want to see ya'll play along! Jodi, this is stunning! I absolutely love your coloring. Somehow this card reminds me of you. Jodi, this is absolutely fabulous! Your coloring is brilliant! 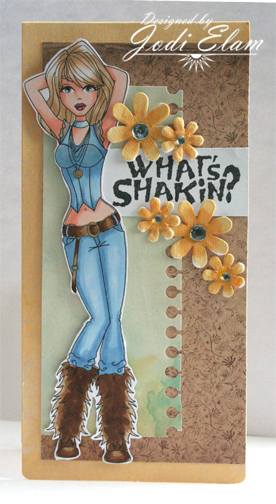 Thanks for sharing your bright and fun card with Simon Says Stamp Show. Sarah.